Edge Contracting, Inc. provides a full range of construction services to southeast Minnesota residential, commercial, and municipal properties. 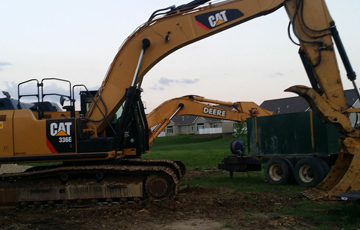 We meet all of your excavating needs to get your construction project up and running. From demolitions, waterway grading, land clearing, new home excavation to site grading for commercial buildings and residential developments. We have the equipment and experience necessary to ensure your project is run smoothly. We are trained, licensed, bonded and insured for all your project needs. 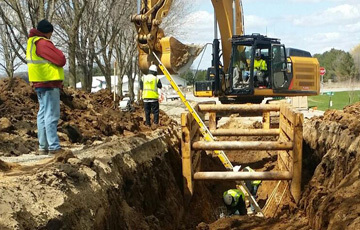 We do sewer and water installation and new utility construction for residential and commercial. We do large municipal sewer & water reconstructs and new subdivisions along with single family septic systems and water hook ups. We install private trench or mound septic systems for homes and commercial facilities. We also have multiple crews to provide you with city sewer and water service, and storm sewer mains for new construction or reconstruction. No job is too large or too small. Construction projects may need large amounts of materials and equipment. Edge Contracting, Inc. provides the tractors and trailers needed for transportation to and from job sites. 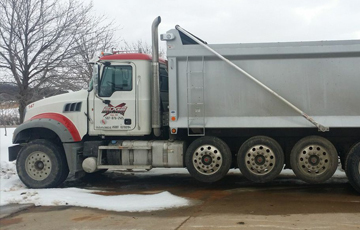 Our dump trucks make moving bedding sand, dirt and road aggregate to a job site easy. If you need debris hauled away from a demolition or extra fill in or out from your project we can do this worry free. Edge Contracting, Inc. is ready to meet all of your trucking needs for any size construction or excavation project. For more information about our services or to request an estimate, contact Edge Contracting by calling our office at 507.876.2415 or emailing office@edgecontractingmn.com.